A few weeks ago I was playing around in Cricut Design Space and I came up with a Christmas design that I originally thought would make a cute pillow. I was planning to make a plain black or white pillow cover, cut out the design, and iron it onto the pillow cover. The only problem, I have a lot of Christmas pillows and don't really need another, not to mention the fact that it really wouldn't have matched the others that I have. I still liked the design though, so I decided I was going to use it anyway. 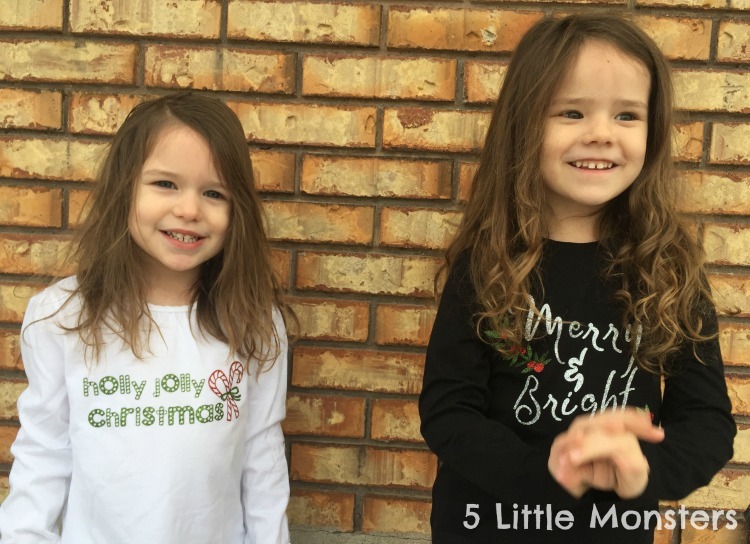 I thought my 3 girls would love some shirts for Christmas so I decided to use that design that I already had and make a couple more to go along with it. 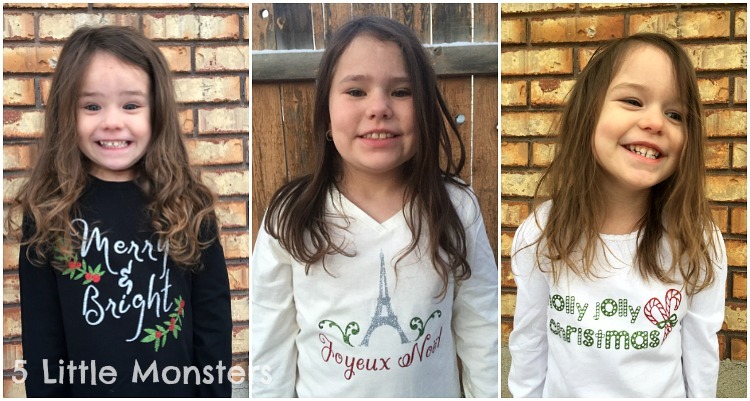 I ended up with 3 different designs and new Christmas shirts for each of my girls. 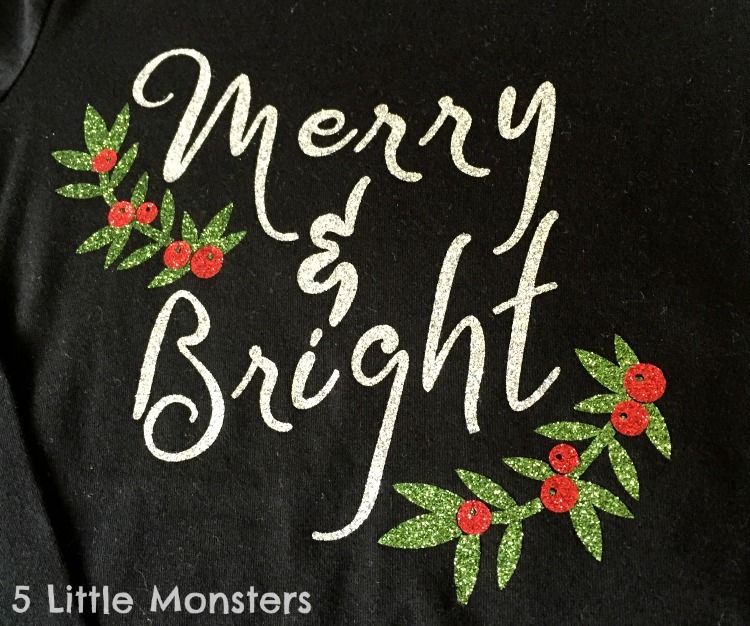 I picked up some inexpensive solid colored shirts at Walmart and used glitter iron on to make them extra fun and festive. One thing I love about making shirts and things with my Cricut is that they hardly take any time at all. Well one of the designs I made was kind of a pain to weed, I should have chosen a different font, but even so they were all pretty quick to make. The first design I made I used for my middle daughter. This was the original design that I made. It says Merry & Bright with some leaves and berries. Since you can't really iron glitter iron on on top of glitter iron on I actually sliced the berry shapes out of the leaves so there are little spaces where they fit into the leaves. 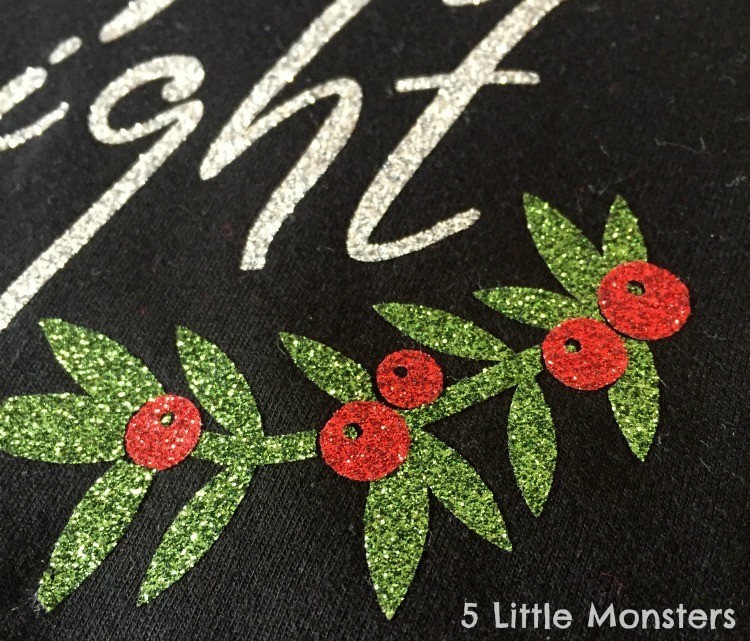 I decided to use a black t-shirt with silver glitter for the words and red and green glitter for the berries and leaves. I really liked how it turned out, this one is probably my favorite of all of the designs. 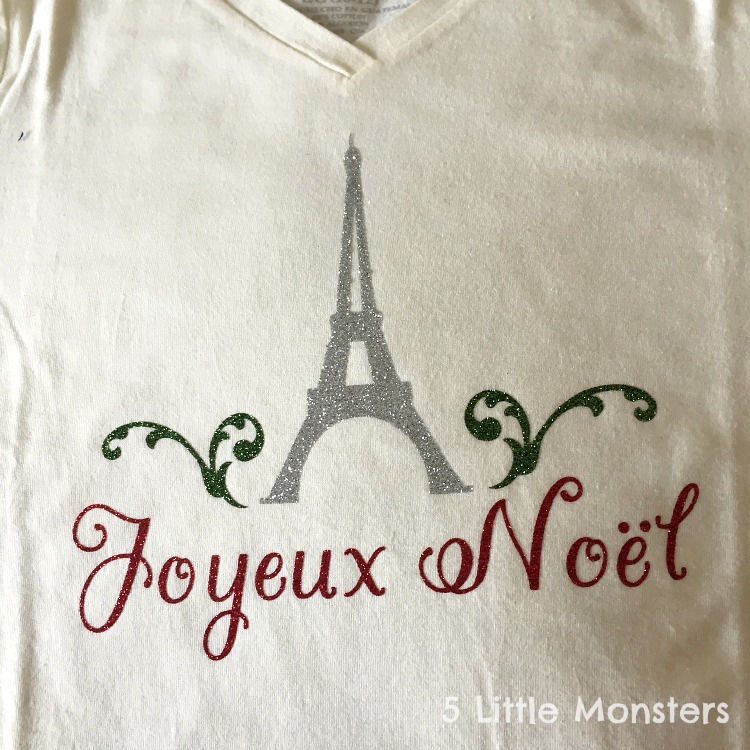 Once I decided I was going to make shirts for the girls I knew that Eliza's needed to have a French theme. She loves anything to do with France, especially the Eiffel Tower. I decided to put an Eiffel Tower with Merry Christmas in French underneath. I added a couple little flourishes just to finish it off. I used an off white colored shirt for this one, silver glitter for the Eiffel Tower, red glitter for the words, and green glitter for the flourishes. When Eliza came home and saw it she screamed and hugged it and said, "Thank you mom, I love it". I will call that a win. I still like the other shirt better but I feel like this one ended up the most perfect for the child it was made for. 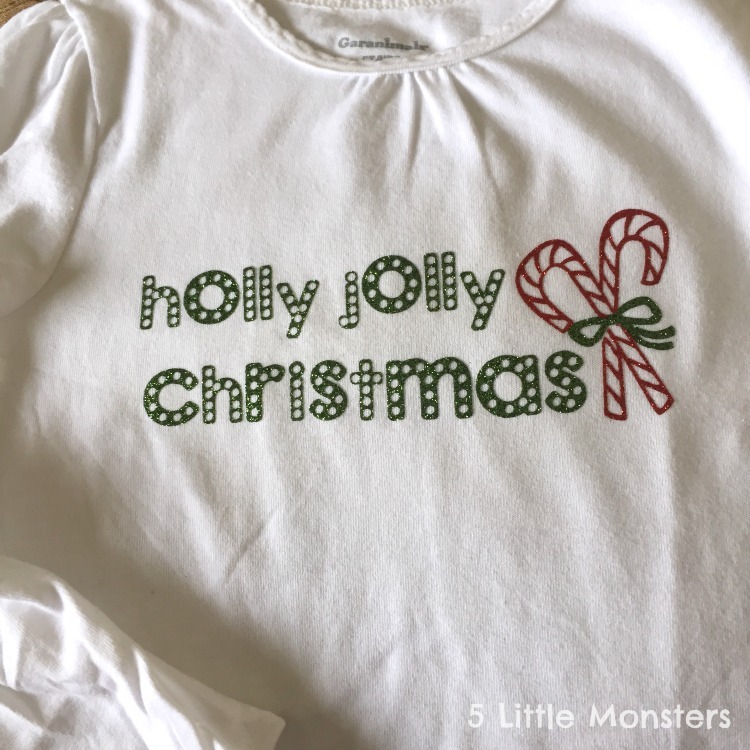 For the last shirt I wrote Holly Jolly Christmas and added a little candy cane. For this one I just used a white shirt and the green and red glitter iron on. This was the one that was an absolute pain to weed. All of those little dots in the letters took forever to get out. In the end I think it turned out cute though. You can find all of the designs I used by clicking on the following links. 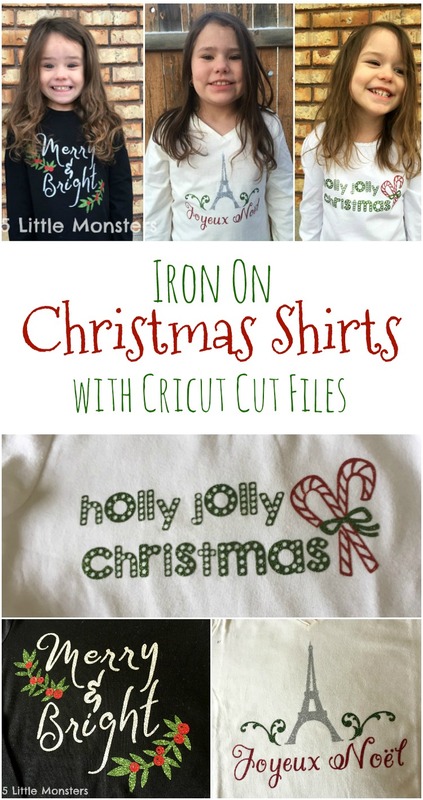 If you have Cricut Access they should be free to cut.